Alexa Scimeca Knierim and Christopher Knierim will be grabbing the lone pairs spot on the U.S. Olympic team after the married couple won the 2018 U.S. National Figure Skating Championships on Saturday in San Jose, Calif. The Knierims posed concerned looks on their faces exiting the ice, as they took a fall on a triple Salchow and also doubled a triple toe, but their score of 206.60 (135.50 in the long program) was enough to overtake silver medalists Tarah Kayne and Danny O’Shea (200.80 total, 131.87 long program). Deanna Stellato-Dudek and Nathan Bartholomay won the bronze medal with 197.65 points. Skating to the soundtrack of Ghost the gold medalists scored highly on an opening quad twist lift, and later, a solid throw triple flip and strong lifts, to secure their second U.S. championship, having won in 2015. Having missed last season’s nationals due to injury, the Knierims finished 10th at the World Championships last spring at Helsinki. During the fall Grand Prix season, they were fifth in both Skate America and the NHK Trophy. 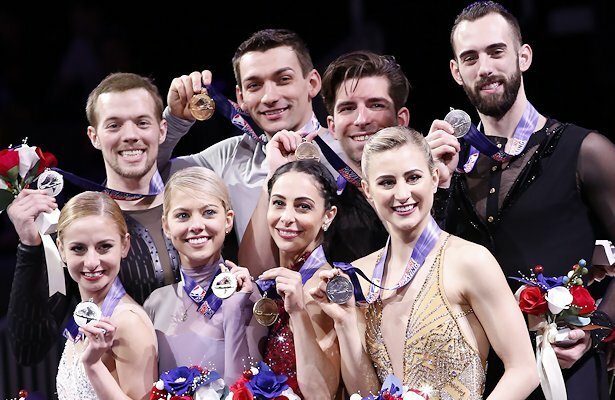 This was also their first U.S. Championships since their June 2016 wedding, and now they will have the memory of skating in the PyeongChang Games to share with their potential future children. Now the Knierims face the task of winning a medal at the Olympics, something a U.S. pairs team has not done since Jill Watson and Peter Oppegard won bronze at Calgary in 1988. Kayne and O’Shea, the 2016 national champions, also missed last season’s event due to injury. Kayne fell on a throw triple Lutz, however, a strong throw triple throw triple Salchow, as well as level four lifts and spins, saved their podium spot. Kayne and O’Shea are coming off winning the bronze medal at Golden Spin on the ISU Challenger Series in Zagreb, Croatia, last month. Stellato-Dudek and Bartholomay stumbled early on a triple Salchow and fell on a throw quad Salchow, before some energetic combination spins amplified the audience, during their U2 program. They improved on a fourth-place finish last season. The 28-year-old Bartholomay skated in the Sochi Olympics with Felicia Zhang, before teaming with the 34-year-old Stellato-Dudek, who might have the most-unorthodox road of any skater at Nationals. A year and a half ago, Stellato-Dudek was working full-time as an aesthetics director at a cosmetic surgery practice in Chicago. She said she was on a work retreat, and all participants were asked to reveal something that yearns deep inside of them. She said she would like to win an Olympic medal and couldn’t believe that she still felt that way after all these years. She brought her old skates out of the closet, which she admits are much heavier than the ones used today, and practiced. Eventually, she landed with Bartholomay at the Southwest Florida Figure Skating Club. In their second year together as a team, Ashley Cain and Timothy DeLuc, who won bronze last year, finished fourth at this event (187.14). Reigning champions Haven Denney and Brandon Frazier were fifth (186.32). 2014 Olympian Marissa Castelli was sixth with her new partner Mervin Tran, a Canadian who is working on obtaining U.S. citizenship. U.S. Figure Skating officially announced today that Scimeca-Knierim and Knierim will be the pair team at theupcoming 2018 Winter Olympic Games in PyeongChang. They were also named to the 2018 Worlds team along with Kayne and O’Shea. Cain/LeDuc, Kayne/O’Shea, and Stellato-Dudek/Bartholomay were named to the Four Continents team.